I don’t know really what to call the above review, as the shady characters behind it seem to keep changing the name, but the look of the site remains the same. The reason why i felt the need to carry out a review of this site is because someone in this line of work asked me about it and although I didn’t know of them, I’m more than happy to carry out a review of what I now know and what you should do about it if you’re tempted. You know all the old saying “if someone seems too good to be true then, it usually is” and when it comes to the Op Money Club or now the Fig Money Club, that is certainly the case. What happens with this site is that, you join up for FREE giving away your first name and email address, so they already gain some of your details to sell on to other list buyers. Once you signed up you’ll be met with a sign which says “start watching payed ads”. Now right away alarm bells should be ringing, as they’ve not even bother to spell paid correctly, so English is not obviously the vendors first language! If you’re internet savvy then, you’ll know if you deal with people and transferring money the site should always be secure (https), but that is not the case in this instance and is just a plain old http! 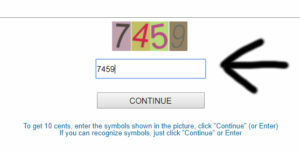 So before you even start clicking adds entering four digit captcha codes think about the lack of web security for a site that is going to be transferring funds and incorrect spellings. The next challenge with this site is how much do they promise you’ll get paid per entry and how is the site funded. Well, they promise you’ll get paid 10 cents per entry and that they get paid by top sponsors like Nike and LG which is total NS, as they’d never be associated with a site like this! I done a mock run on these codes and was achieve a balance of $18 in just 15 minutes which equates to $72. Now, this is a huge amount of money for something which is FREE to join and doesn’t require any skill, but of course it’s FAKE! 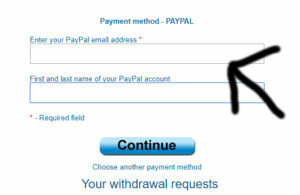 You get conformation of that once you enter your Paypal account details. Note. Don’t enter you main account details or you could be in for a shock. Surprise, surprise when you go to cash out is says you need $150 before you can cash-out, which is a very high threshold for any platform, but again you could reach that figure in just over two hours. 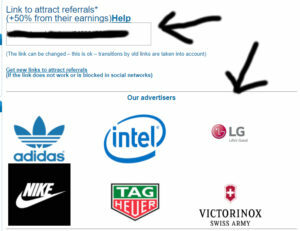 Another part to consider and if you’ve every been involved in paid ads like the Google Adsense program is that, you get paid after a certain length of time, so even if you generate more than $60 per month, you still have to wait at least 40 days until you receive any money for that particular months revenue. 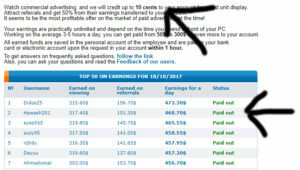 So, if you can earn $150 in about three hours and then, wait 1 to 2 days to get paid then, ask yourself how would they possibly fund that. Do you honestly think they could generate that kind of cashflow in order to pay people? In a nutshell 100% NO and none of the above brands would go anywhere near a site like this! One of the other things they seem to do is once a site is shut they just get another domain address like the one at the top of this page, but the template remains the same and all they do is change the header to the new name. I really do hate shady operators like this, as it makes this internet marketplace a bad place to be and the genuine people like myself suffer because of the bad taste it leaves in folks mouths. Just as I was about to end this review I noticed yet another spelling error at the bottom of the page which the haven’t even tried to fix when there old sites get found out. So instead of the word “feedback” we have “fedback”! In my 8+ years in the online marketplace, this has got to be one of the worst and most blatant scams I’ve come across. Do yourself a big favour and stay away from the Op Money Club or the Fig Money Club and find something which genuine and you can build and hang your hat on. This entry was posted in Products and tagged club, money, op, review by MDB Marketing. Bookmark the permalink.